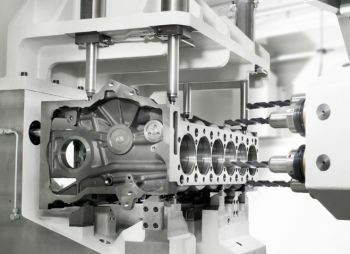 HELLER Machine Tools has introduced a new compact 4- and 5-axis horizontal machining module designed with a wide range of standard equipment and spindle drive options for cost-effective adaptation to different high-accuracy machining tasks, particularly for flexible series production in automotive applications. The HELLER MC20 machines may be deployed as stand-alone machines today and converted for parallel as well as series production tomorrow. The modular design allows the machines to be scaled to meet individual requirements. The MC20 machining module is designed to provide optimum characteristics in terms of dynamics, machining accuracy and chip disposal and is designed for wet, or MQL machining, making the machine well-suited to machining a wide range of material from aluminum to iron and alloy steels. The work area of the machine is a generous X stroke of 800mm, Z stroke of 800 + 200mm loading stroke, and a Y stroke of 750mm. The work piece moves in the Z axis while the tool moves in the X and Y axis in a vertical Y slide and X traversing column. A system tool magazine directly above the main spindle carries HSK 63 or 100. The X axis carries the traversing column which is designed for high dynamics and excellent process rigidity and stability. This design offers excellent conditions for machining processes with high performance requirements. The Y axis is designed as a vertical slide in cast construction. The bridge-type Z axis is equipped with 1 or optionally 2 drives. The A axis is designed as swivel traverse in L-form or in optional U-form. "The MC20 modules are a product of HELLER's experience in designing machines that can be adapted to provide the lowest possible cost per piece in a range of production machining applications. HELLER matches machine speed and torque to material, provides easy access to work areas and tools, and creates a bed and frame that provide optimum rigidity even in heavy cutting over years of operation," said Vince Trampus, HELLER Vice President of Sales. The main, direct, liquid-cooled spindle drives deliver power at the spindle for optimum milling characteristics and the ability to achieve fine boring quality. Four different spindle drive options are available to best handle a wide range of different work materials. 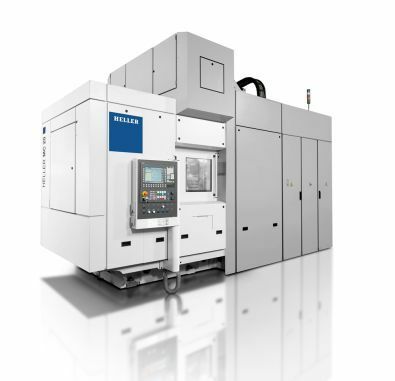 Heller has equipped the MC20's with its temperature compensation program, especially critical for MQL machining. Part temperature is measured in the work area and spindle offsets are automatically adjusted during the machining cycle. All linear axes are driven by digitally controlled, maintenance-free and fully-enclosed synchronized AC motors. Unproductive idle times are minimized by drive systems designed for high rapid traverse and acceleration rates. Absolute measuring scales mounted on all linear axes give direct path measurement and contribute considerably to a high degree of machining accuracy. Specially installed guarding ensures fault-free operation of the re-circulating ball-screw drives and measuring system and protects them against chip and coolant contamination. Additionally, the linear measuring system is purged by air pressure. To control heat growth and minimize temperature influence on accuracy, the mounting faces for the axis drive motors are optionally available as water-cooled flanges on the machine base and the column. 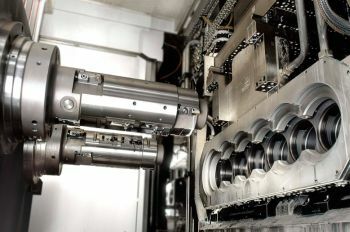 Depending on the machine size, the tool spindles are equipped with HSK-A63 or HSK-A100 hollow shaft taper and are mounted directly into the housing with pre-loaded precision spindle bearings. Lifetime lubrication ensures that the bearings are absolutely maintenance-free.